Oh the symmetry!!! Lights, look at the lights! 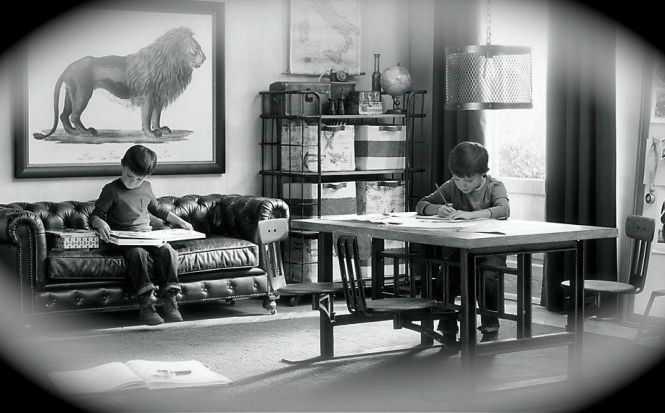 Even though my next house is only at plan stage, I am looking for inspiration for my boys' rooms. I don't know about you but I am seriously over the 'primary colours' and 'red, white and blue nautical' themes that have done the rounds for the last decade. Guilty as charged. 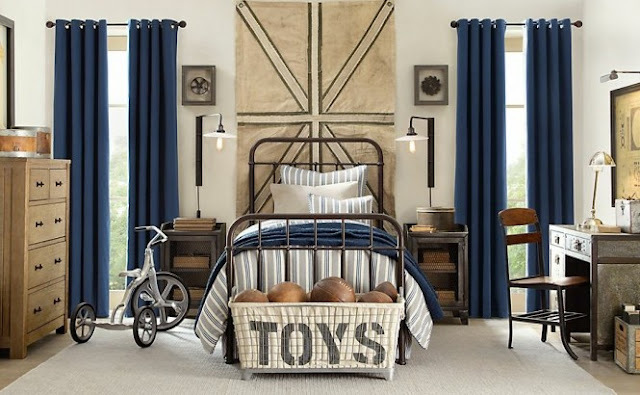 I am slowly getting my 'industrial' on, right across the design board, and love how these beautiful traditional boy's rooms, from Restoration Hardware, incorporate industrial accents with blue and neutral tones and pops of leather and rustic browns. ... more leather, metal... bedhead, desk and bedframe... but it is still imbues a cozy feel due to the carpet and the leather pouffe and chair. I love the crate under the desk, and the metal wall organisers flanking the rustic blackboard. Look at the two pendant lights over the desk! Keep breathing! ... now there's a thought!... my small Orb Chandelier in a boy's room. Perfection. .... and what kid's room is complete without a Chesterfield. I mean really. Check out the desk and the metal shelves... and that light! 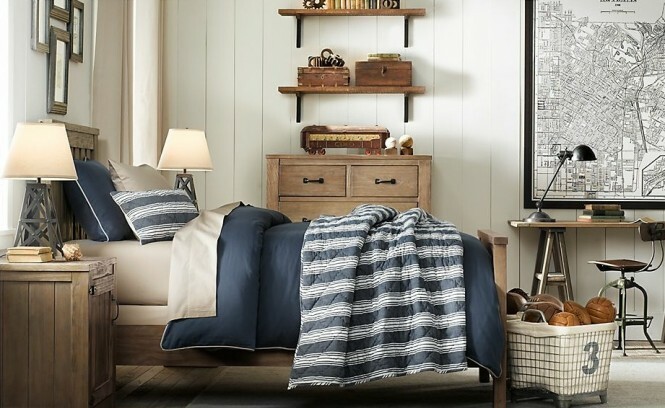 Yep, I think I have found my boys' room inspiration. I think these are timeless. Put these little boys in 19th century sailor suits and black and white that photo... and this could have been a boy's room 200 years ago... look no computer's, children reading and drawing.... just like they did before the zombies took over our children and rendered them incapable of leaving their Nintendos and going outside in the fresh air to play soccer and ride bikes! See?... so just imagine them in their sailor suits. So 1800's... so Sherlock Holmes-ish! What do you think? Do you love the subtle 'industrial' edge in these rooms? At least the furniture would withstand the rough and tumble of 'boy life'. Speaking of rough and tumble, I'm off to the shed and then I am doing something active with my boys this afternoon, before I head to Melbourne tomorrow. Love Restoration Hardware, they have great room inspiration ... Just wished they shipped to Australia! I'm still in love with the lamps we bought from them a few years ago and had a family bring back to us. I think they are all very lovely and would make the transition from boy to young adult quite easy. They're fab really, probably much more stylish than my bedroom will ever be!! Don't you just want to jump on the beds in the room with the two singles? Those doonas look so comfy! Great post! 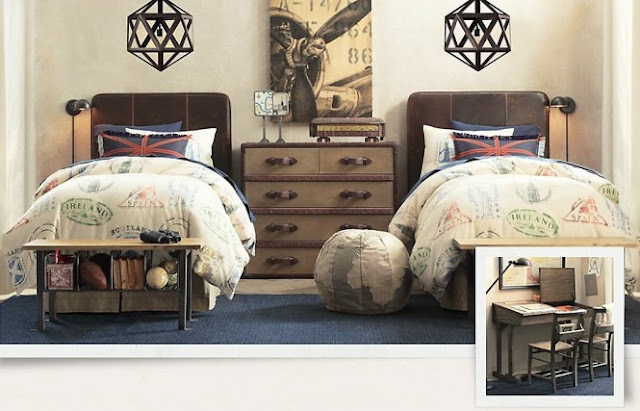 I am planning my oldest son's "tween" room, and I've been looking for inspiration, too! Loving the industrial look. I, too, am over blue and red. I've got 4 boys and I'm ready for a bit of a change. Some great inspiration, love the industrial feel! Love, love love. We are almost at the end of the bunk bed era (not cool enough) and I have been looking for some inspiration that isn't red white and blue! This is perfect. I too love the muted earthy colours and the fact there is no computer in sight. That Chesterfield is so OTT but it is fun. I also really like the ball holders on the wall. They would be excellent in my house - not with stylish colour co-ordinated balls but the everyday type I am over collecting from all around the house. Now, if someone can just tell me where I can find a black and white poster of a Ferrari we are in business! I am taken with the idea of post-war ratty English country house: plenty of space, plenty of light, but rather battered, comfortable furniture and vaguely Empire posters - the lion does very well! Absolutely love that industrial vibe. I think my grown up husband would also want to deck out our rooms with a Chesterfield and that wall display of footballs and basketballs! 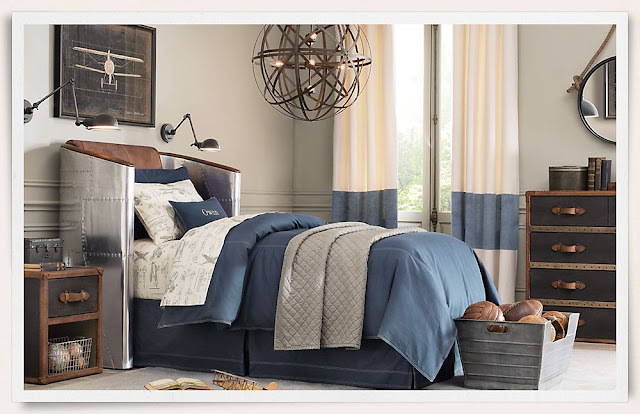 There is a Restoration Hardware here in Edmonton and I LOVE going there to dream about how I'd love to decorate my space. Have a good trip to Melbourne! 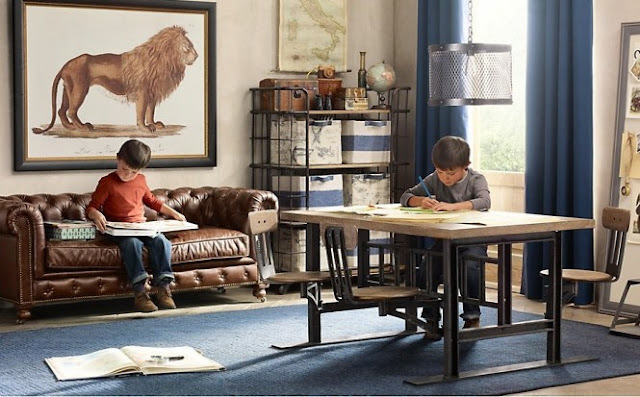 Loving the industrial look - will your boys be happy with this or are they non-fussed? Do they want much imput into their new rooms? My kids love input into their rooms every time their mother gets a need to change! My daughter has a bright red wall at the moment! My son loves his taupe walls with sky-blue feature wall and red bookcase up one wall. You always give me such great inspiration! Love all these boys room ideas. I have three rooms to furnish, so any ideas are always welcome. I adore this A M.. Wondering how to do a girly version....mmm,all though I know my Dd would not mind these for boys at all! hi darl - absolutely gorgeous - perfect for my boy too! I'll be pinning them for sure, thanks luv! Inspirational, for sure! Now to incorporate 3 beds in one room for the 3 boys..Ditto on incorporating some of the ideas n a girly version! What an amazing collection of inspirational ideas - we are totally pink in this household however am sure I could utilise some of these ideas - love the bedlinen too! I'm inspired A-M! Making the plans for the boys' rooms as we speak. Hubby is going to the States towards the end of the year so I may convince him to struggle home with some new items ;). Your Small Orb over a bed would look incredible! Quick, Have I Forgotten Anything? Killing Time Or Living In The Moment?